Four Americans, including two service members, one Department of Defense civilian, and one contractor, were killed in a bomb blast in Syria, the U.S. military confirmed Wednesday, in the deadliest attack on the U.S. military since American troops went into Syria and the first claimed by ISIS since President Donald Trump ordered a U.S. withdrawal claiming ISIS had been defeated..
Three U.S. service members were also injured by the explosion while the group was conducting a local engagement, according to a statement from U.S. Central Command. 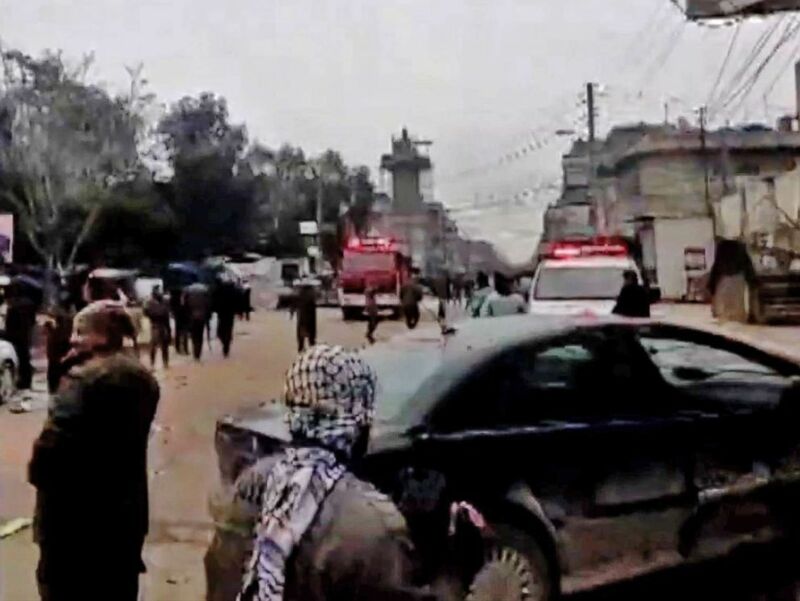 In claiming responsibility for the blast, which occurred in the northern city of Manbij, ISIS said one of its members carried out a suicide attack and detonated a vest with explosives, according to the Associated Press. Since U.S. troops entered Manbij nearly two years ago, vehicle patrols have included “dismounted” patrols with American forces in the city on foot, which is what it appears the Americans who were killed were doing at the time of the explosion. An image grab taken from a video published by Hawar News Agency (ANHA) on January 16, 2019, shows people gathered at the scene of a suicide attack in the northern Syrian town of Manbij. The U.S. military does not release the names of those killed until 24 hours after next of kin notification. Wednesday’s deadly incident comes about one month after President Trump ordered 2,000 U.S. troops to leave Syria with the declaration of victory over ISIS. But since then, there has been growing confusion over the withdrawal plans, as the administration shifted from a 30-day timeline to one that is now “conditions-based” to include the enduring defeat of ISIS, protection for the Syrian Kurds, and assurance that Iran can’t increase its influence in the region. Sen. Lindsey Graham listens as Sen. Robert Menendez speaks during a press conference at the U.S. Capitol, Dec. 20, 2018. Graham, Menendez and Sen. Jack Reed spoke out against President Trump’s decision to remove U.S. military forces from Syria. 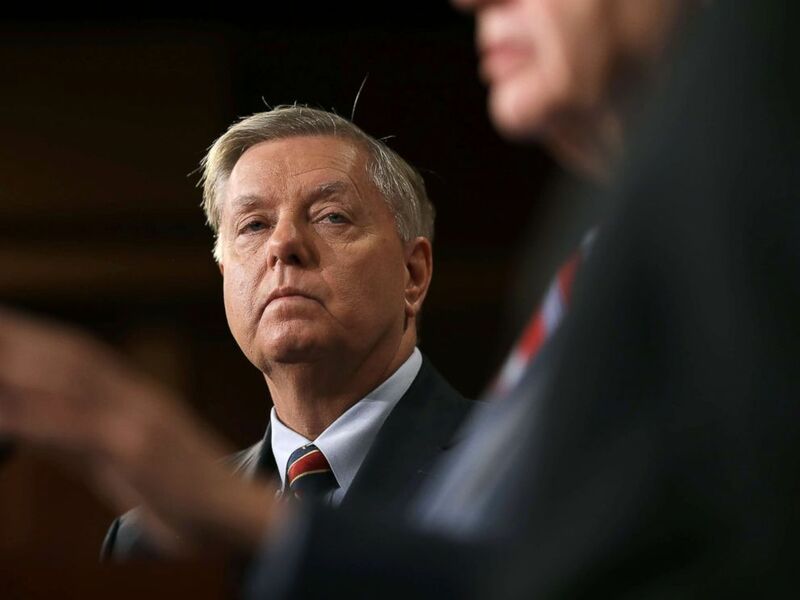 Graham, who said he believed the Americans were killed at a restaurant he had visited during his visit to Manbij last July, said he hoped the president would reexamine U.S. policy in Syria. Four other American service members have been killed in Syria since the U.S. entered the country under the Obama administration in October 2015. Those Americans were: Navy Senior Chief Petty Officer Scott Cooper Dayton, Air Force Staff Sgt. Leo Austin Bieren, Army Spc. Etienne Jules Murphy, and Army Master Sgt. Jonathan Jay Dunbar. The president’s surprise announcement last month led to an outcry from U.S. partners and allies and a series of high-level resignations, namely that of former Defense Secretary James Mattis who felt the U.S. was abandoning its allies and partners in the region. One of the chief concerns has been how to protect the Kurds, a group that’s been a critical U.S. partner in the fight against ISIS but which Turkey views as terrorists. In a series of tweets on Sunday, Trump suggested that a 20-mile “safe zone” could be created to decrease tension between the two groups. The president also discussed the idea by phone with Turkish President Recep Tayyip Erdogan on Monday, according to a Turkish readout of the call, but the White House has not provided details about how that zone would be enforced. In the past week, the U.S. moved some equipment out of Syria, but no troops, two U.S. officials told ABC News. American service members will remain in Iraq, and Trump has suggested as recently as Sunday that they could “attack again from existing nearby base” if ISIS or another terrorist group emerged. Despite Trump’s declaration of victory over ISIS, State Department and Pentagon officials had cautioned as recently as the week before his announcement that the fight was not over — with the U.S. recently estimating that about 2,000 ISIS fighters remain in Syria. According to statistics released by U.S. Air Forces Central Command last week, the U.S. and coalition aircraft dropped the highest number of bombs over Syria in the month before the president made his withdrawal announcement: 1,424 weapons released in November, up from 876 in October and 758 in September.